Do We Need an NI Number? Home > Ask Our Experts > Do We Need an NI Number? My husband and I are both in our 50s and are moving to the UK in April to work for approx 2 years, we both have British passports but need a NI number. We are opening a British bank account before we leave, can you tell me how, when and where we apply for an NI number? Yes, you will need a National Insurance number if you want to work in Britain. You say you are both British citizens who have been living abroad without giving any more details about your background. If you lived in Britain previously then left to live abroad, it’s possible that you already have national insurance numbers from long ago. 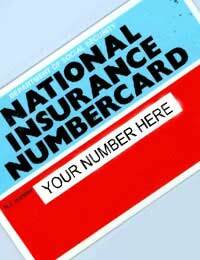 A national insurance number remains the same throughout your life. If you have no records of what your national insurance number was, the government may be able to find them for you when you apply for a new one. Contact a Jobcentre or HMRC to inquire about this. If you do need new national insurance numbers, you can begin the application process by calling 0845 600 0643. If no previous record of your national insurance number is found, you will normally be asked to attend an interview and to bring certain documents with you. There would usually be a separate interview for each person. Typically, these interviews will be held in a Jobcentre or social security office. Exactly which documents you are asked to bring will vary depending on the circumstances of your application. Essentially, however, they are primarily concerned with establishing your identity, so you can expect to be asked to produce things like birth certificates. If you have lost these, you can get fresh copies from the General Registry Office. The documents you are asked to bring have to be originals. Photocopies are not accepted. Sometimes you will be asked to leave these documents behind so that they can be checked out more thoroughly. Of course, you will get them back later. Typically, a decision on whether or not to allocate you a national insurance number will not be made until some weeks after the interview you were asked to attend. If you are British citizens, however, this should normally be a routine matter. You will also eventually get a card with your national insurance number on it. In certain circumstances, your prospective employers in the UK can apply for a national insurance number on your behalf, and this application may be treated in an expedited fashion. Can a UK Based Company Obtain an AUG Licence? Do I Need to Worry About UK Taxes? What Happens to My NI Payments When I Emigrate? Can my Wages be Paid into a UK Bank Account? We live in Portugal and my daughter is now over 16. She was born in the UK and has a UK passport. She would like to apply for a NI as she may want temporary work in the UK. As she is a British Citizen can she apply for a NI number whilst still abroad?